Growing up in Ladora, Iowa, Mildred "Millie" Benson had ample time to develop her imagination and sense of adventure. While still a journalism graduate student at the University of Iowa, Millie began writing for the Stratemeyer Syndicate, which published the phenomenally popular Hardy Boys series, among others. Soon, Millie was tapped for a new series starring amateur sleuth Nancy Drew, a young, independent woman not unlike Millie herself. Under the pen name Carolyn Keene, Millie wrote the first book, The Secret of the Old Clock, and twenty-two other Nancy Drew Mystery Stories. In all, Millie wrote more than a hundred novels for young people. Millie was also a journalist for the Toledo Times and the Toledo Blade. At sixty-two, she obtained her pilot's license. Follow the clues throughout Missing Millie to discover the story of this ghostwriter, journalist, and adventurer. "Rubini frames the story as a mystery, asking why, despite Nancy Drew's fame, most people have never heard of Benson and tracking down clues and evidence to uncover more information about the life of this little-known author.... VERDICT A solid option for those interested in the 'Nancy Drew' mysteries." "Digging into archives and the memories of surviving acquaintances as well as published histories, Rubini spins an account of Benson's long and active life that throws a strong light on the source of Nancy Drew's own admirably intrepid and independent spirit....An enlightening peek behind the curtain for Nancy Drew fans." 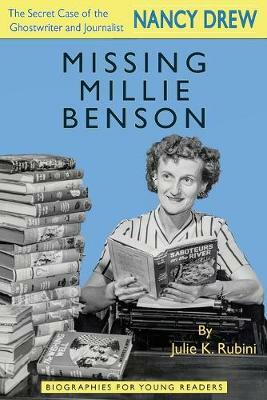 "The biography is eminently readable and well organized...Appended with an impressive wealth of back matter (`Extra Clues') including a timeline, a chronological list of Millie's books, a glossary, source notes, and an extensive bibliography." "Though this biography is written for young adults, there's plenty to interest adult readers, especially the successful, albeit formulaic, system Edward Stratemeyer used to create so many young adult series. Rubini brings Millie's world to life." "There are several helpful appendices, including a glossary of the key terms that have been presented in bold face in the earlier text. From `alma mater' to `writing credits,' and including `Gallup Polls,' `penchants,' and `ratified,' this list delighted me with its obvious respect for children's capacity to understand complex matters. ... In sum, this is a delightfully quirky read. ... The book has the potential to develop a new generation of literary scholars." "Rubini's book is geared for younger readers, but the best part of the book is that Rubini slyly teaches children what scholarly historical research and writing looks like... the book still offers much for adults in its insight into book syndicates and in the life story of an under-discussed but important author in children's literature." "Historical photographs and interesting sidebars enhance the story of this Toledo treasure whose identity as a ghostwriter remained a secret until she testified at a court case between two publishers claiming rights to new Nancy Drew stories."